Start by peeling and slicing your apples, and then slicing up the onion as well. This is the 'hard' part. (And that's how you know it's gonna be easy!) Open up your sturgeon package and sprinkle the fish liberally with seafood seasoning. If your seasoning is 'no salt', sprinkle some salt on the fish as well - it will bring out all the flavors. Now, toss in the butter and slide the sliced apples and onions right on top. You might turn your burner down just a touch, but not too much. We're going to spend the next 6-7 minutes caramelizing the fruit and veg, so toss occasionally but don't fuss with them too much because we want some of that nice golden brown. 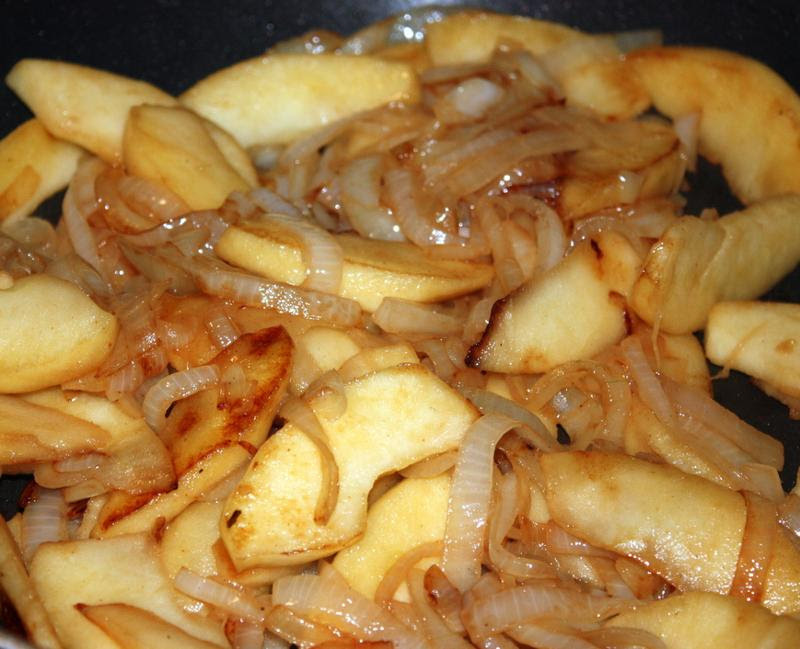 Once your apples and onions are cooked down, add a little bit of salt and the cup of vegetable stock. Return your sturgeon chunks to the pan and tuck them in a bit so they reach the bottom of the pan. Pop a lid on your creation and let it all bubble and simmer for about 4-5 minutes more. Serve each sturgeon steak with a pile of apples and onions on top and prepare to be impressed. The perfect late winter meal - enjoy!